So what makes one SD card better than another one. The brand? Is the brand name just something you pay extra for like in many other cases? Speed? What makes one card faster than another one? Reliability? Is one card more reliable than another one? What about the effect on your camera’s battery life? Sandisk has been the leader in flash memory technology for a long time now, they in fact hold the patents for a lot of the memory cards we all use today. Sandisk has become a brand we can rely on, so yes brand makes a difference. I did not think speed would make a huge difference. So I did a time test. I took a folder of images, which about 1GB, and copied it to a new Sandisk Ultra (The entry level Sandisk card) and timed how long it took. 2 minutes 3 seconds. Not a bad time. 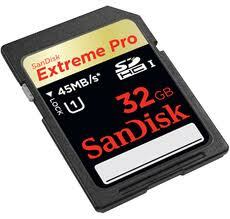 So what about the Sandisk Extreme Pro I was actually testing? The same folder, approx 1GB took 46 seconds to copy to the Extreme Pro SD Card. So yes speed makes a difference. That was a time saving of 1 minute 17 seconds, imagine you were copying 16GB, you would save over 20 minutes using the faster card. Reliability is something we could all do with more of. Are you willing to risk using a cheaper card and not getting your pictures? Battery life? I hear you asking, how does my memory card effect my battery life. Well going back to my point earlier on speed. If a slow card requires more time to write the files then your camera will be processing information longer and using more battery power to write to the card rather than being able to take more pictures on the card. Well at least that’s the theory, I still have to test that one. So in conclusion do I think it worth spending a bit more money on a Sandisk Extreme Pro Memory Card. Yes. I just had a SanDisk Pro card fail on me miserably after a client’s wedding. I was absolutely devastated and fortunately, a company in New England bailed me out and was able to recover the photos. I will NEVER use SanDisk again and in the process of purchasing all Hoodman cards to ensure that I never have to endure that worried feeling again. Thats a tough one, sorry to hear that. There is always that risk with cards. Sure the higher end the go the lower the risk of that should be but I have heard of such a story from almost every brand at least once. The key for me is how they respond to such an issue. I believe in the USA for example, Lexar have a special program to help photographers with their top end cards recover their images if such a thing happens.